1999—the 456th Convocation with speaker Bill Clinton. 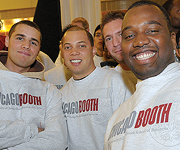 2008—Students celebrate alumnus David Booth’s record gift to the business school. In the 28-year history of the University of Chicago Chronicle, an editorial has never graced these pages, but it seems fitting to say farewell in ink on paper. This issue of the Chronicle is the last print edition of the University newspaper. The Superphone offered cutting-edge features such as conference calling, redial at the press of only one digit, caller ID, call waiting and call forwarding. Now, fast-forward to 2009. I’m writing this on my iMac at home, from which I can send this document via my University Web-mail account to my editors’ “superphones” — a Blackberry, an iPhone or any other handheld device. I might later post a link to this piece on my Facebook page, where I can share it with my network of friends, including Meresamun, a 2,800-year-old mummy who resides at the University’s Oriental Institute. The brainchild of two University communicators who wanted to get the word out about a new mummy exhibition at the Oriental Institute, Meresamun’s Facebook page was launched as an experiment by my colleague William Harms and Oriental Institute Research Associate Emily Teeter. Within weeks of posting her page, Meresamun was a hit, with more than 900 people becoming her Facebook friends. Since then, she has posted pictures and video, hosted songwriting and drawing contests, and spawned mummy imitators at institutions across the nation. As technology leaps through the 21st century, the News Office staff will continue to step forward with new ideas and methods for communicating University news to its extended community. For 28 years, the Chronicle has been one means of delivery for spreading news of the good work of the faculty, students, alumni, staff, friends and administrators of this great institution. There’s no stopping technology’s momentum; but even as we leave behind the printing press for the many new processes we are beginning to embrace, our essential mission in the News Office continues—to tell the stories about the people and ideas that live and grow at this unique place on the South Side of Chicago. I’ve had the privilege of being one of the storytellers since Oct. 1, 1998, my first issue as editor of the Chronicle. I’ve edited and designed much of the content of 11 volumes of the Chronicle, the equivalent of about 200 issues. Multiply that by 12, and you get an average number of stories produced during that time. Did we make mistakes? Of course we did. Did our readers point them out? Of course they did. And when you have an e-mail in your inbox from Hannah Gray, you also know you are going to learn from your mistake. In a sense, the Chronicle has been my personal textbook. Through its stories I’ve learned about more fields of study than I can mention here. I’ve had lessons in the tangible and the abstract, tested theories, entertained hypotheses and posed questions for curiosity’s sake. Since 1998, when I came to the University, I have been involved in communicating much good news. I’ve been the editor during three University administrations; have worked on news coverage involving three U.S. Presidents; have witnessed 14 students win Rhodes scholarships and 13 faculty members, alumni or researchers receive a Nobel Prize. There have been some memorable Nobel moments, and I’ve tucked away a few that I can share here. The News Office staff is on alert every October as the Alfred Nobel Foundation approaches its announcement of Nobel Prize recipients. I remember the year 2000, when James Heckman won the Nobel Memorial Prize in Economic Sciences. Professor Heckman was out of the country presenting at a conference when the news came. Without the guest of honor present, we contacted Professor Heckman via telephone and placed him on speakerphone in the McCormick Tribune Lounge in the Reynolds Club. There, only in voice and spirit, James Heckman greeted members of the media who focused their cameras and microphones on a telephone projecting his voice. This made for some interesting news coverage in pictures. In 2009, Heckman might have Skyped from South America. 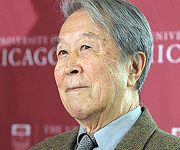 This past year, Yoichiro Nambu received the Nobel Prize in Physics, and his presentation ceremony, an unprecedented event held on campus, was Webcast live on the University’s homepage. I knew early on that being the Editor of the Chronicle and part of the University’s News Office would expose me to ideas and people I couldn’t have imagined covering before. 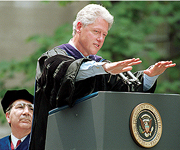 In the summer of 1999, President Bill Clinton spoke at the University’s 456th Convocation. I was about six months into my new job when the surprise announcement of Clinton’s visit was made, and the News Office began a months-long plan to host the 42nd U.S. President in June. Our staff was deployed across the Main Quad on June 12, 1999, charged with keeping reporters in check and relatively happy with their assigned seating. Even with a walkie-talkie in hand and standing among a large number of Secret Service staff during the ceremony, I wasn’t prepared for the task of keeping one very persistent TV reporter from hounding students and their family members after the ceremony. I discovered then I wasn’t a media bouncer, as some of my colleagues have been, and I couldn’t wait to get back to the office to write, edit and prepare our coverage of the day’s events. I ended that 12-hour day, proud to have been a part of University of Chicago history. When you are the editor of the University of Chicago’s newspaper, you have to get used to covering the same news that often appears locally, nationally and even internationally. Hyde Park’s man of the year and former Senior Lecturer in the Law School Barack Obama became America’s 44th President in November 2008, creating an electricity here on campus and in the neighborhood that had never before been experienced. Obama’s presidential campaign, his election victory and rally in Grant Park on Tuesday, Nov. 4, 2008, followed by his inauguration on Jan. 20, 2009, made the Chronicle pages, just as they had landed on the pages of the Chicago Tribune, The New York Times and the Times of London. Laurie Davis is Editor of the University of Chicago Chronicle, UChicago News and Web features. Please visit us in the fall at http://news.uchicago.edu for the debut of our new Web pages.